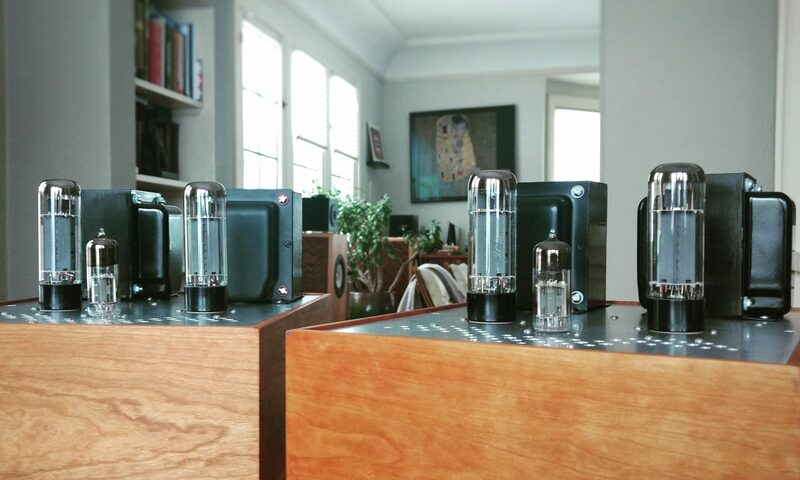 Besides the grounded cathode amplifier, there’s another very common arrangement for a tube that you are sure to run across. It’s called the cathode follower and it doesn’t amplify sh!t, at least not in the voltage embiggening sense. Note how the output in this diagram is in a different place than what you’ve seen in amplification stages. It’s at the connection to the cathode resistor instead of the connection to the anode resistor. We’re going to ignore the anode resistor for the moment. We know that the grid will have a more negative voltage potential than the cathode because otherwise it starts attracting the cathode’s electrons instead of allowing them to zip to the anode. When the grid is very negative, it doesn’t allow many electrons (current) through and when the grid is not quite so negative, it lets more electrons through. The grid’s negative relation to the cathode is achieved by biasing the tube. It is the difference between the grid voltage and the cathode voltage that allows a tube to modulate the current through it. Consider the numbers in the example. What’s the voltage dropped across the 10,000 ohm cathode resistor when the circuit draws 15mA and has a 300V supply? Now if a positive change in the grid (making it less negative) allows another 5mA through the tube, what is the new voltage drop across the cathode resistor? The cathode voltage wants to increase, but if this happens, the grid’s voltage in relation to it would become more negative (which would let less current through the tube and force the voltage across the cathode resistor back down). The opposite happens if the grid sees a negative signal: fewer electrons passed through the tube would lead to lower voltage across the cathode resistor (thus the grid becomes less negative in relation to it and wants to let through more current). The two opposing forces are in a tug of war and, more or less, cancel each other out in the cathode follower. This epic battle between signal and bias is also at the core of the concept of feedback in tube amps. The difference in voltage between the grid and the cathode is what lets the tube control the flow of electrons. Changes in voltage on the grid (holding the cathode constant) have a reinforcing effect on this flow, but changes in voltage at the cathode (holding the grid constant) have an opposing effect. Ultimately, the output voltage (taken across the cathode resistor) follows the grid voltage up and down by about the same amount that the grid itself moves up and down because that’s all it can do. The cathode follower can’t make the voltage changes at the cathode any bigger than the changes at the grid because it otherwise affects the difference between them and the difference is what determines electron flow. Yes, that is confusing as all f*%k. Don’t have an aneurysm trying to understand it all immediately. Bottom line is that the cathode follower doesn’t embiggen the voltage from the grid, but it does add the current through the tube to make the signal stronger. Making the signal stronger often helps it cope with driving following stages. The cathode follower is often used in this ‘buffer’ configuration specifically to provide low output impedance. Think of a cathode follower like a grounded cathode amplifier in that the grid modulates conduction through the tube and load resistor. This is possible because the grid is biased negatively compared to the cathode (the negative bias is what allows it to modulate electron flow). In a grounded cathode amplifier, the current through the load resistor at the anode is what produces an amplified voltage (compared to what is at the grid). This is simple Ohm’s Law. In a cathode follower, the grid is still negative relative to the cathode and this still allows it to modulate conduction through the tube and the load. But in a cathode follower, the load is at the cathode instead of at the anode. The grid cannot make itself less negative relative to the cathode because it is this negative relation that allows it to modulate current in the first place (the cathode load transforms this current into voltage according to Ohm’s Law). In the cathode follower’s case, the tube is amplifying into its own bias. Thus 100% negative feedback and, typically, very linear behavior.